Huge Savings Item! 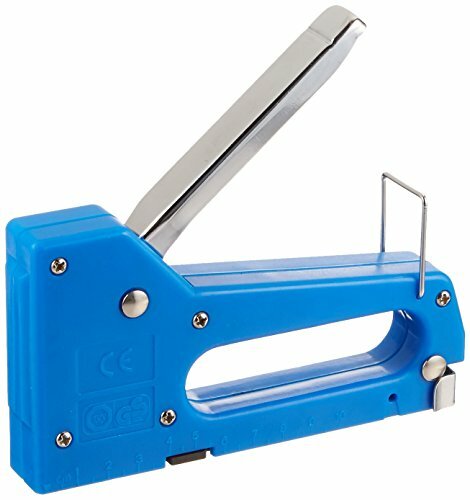 Save 11% on the Dritz 9050 Light Duty Staple Gun (Colors May Vary) by Dritz at N Online Agency. MPN: 9050. Hurry! Limited time offer. Offer valid only while supplies last. Light duty staple gun is use to attach fabric to furniture cornice boards and other home decor projects. Works on wood - dry wall foam core and more. Light duty staple gun is use to attach fabric to furniture cornice boards and other home decor projects. Works on wood - dry wall foam core and more. Always wear safety glasses when using this tool. Never point staple gun toward face. This product contains lead and other chemicals known to the State of California to cause birth defects and other reproductive harm. Instructions are to load staples push in plunger at back of staple gun- then pull down and pull out. Place staple strip in channel with staple points down. Replace plunger by sliding in completely. Push up to lock in place. To use -position front end of gun over area to be stapled and apply light pressure. Squeeze handle firmly to staple. To lock - remove staples first. Point staple gun away from body and squeeze handle until closed - swing metal loop over handle. If you have any questions about this product by Dritz, contact us by completing and submitting the form below. If you are looking for a specif part number, please include it with your message.